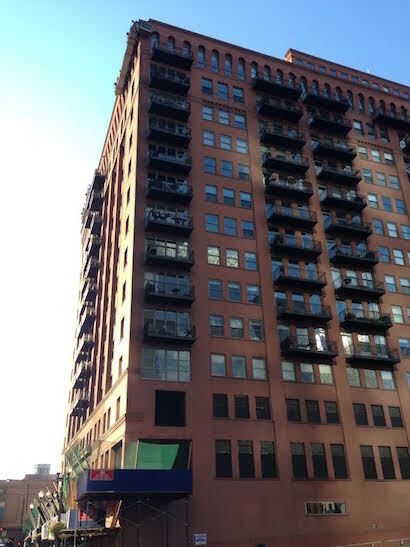 Kudos to AAA-1 Masonry & Tuckpointing's veteran project manager, Frank Kruk, for starting the second phase of work on the Daniel Burnham-designed Randolph Place condominium building in Chicago! Due to this building's age, positioning of retro-fitted steel balconies, multi-level roof design, and busy Chicago traffic below, this project has been a fun challenge for Frank, who is recognized as one of the industry's most experienced licensed masons. In the photo aboveat right you can see how Frank and the men have set up their swingstages at the top of the building, while heavy-duty pedestrian canopies and debris nets are positioned below. AAA-1 Masonry & Tuckpointing applies the same experience and energy restoring legendary century-old structures like Randolph Place as it does your family's brick three-flat or your mother-in-law's concrete block condominium. With over 60 years of continuous experience, we possess the skills needed to restore your masonry structure back to its original, glorious condition. Give us a call and we'll explain how.